Great Wines Are Waiting in the Animal Kingdom Lodge Gift Shop. Zawadi Marketplace and Jahari Treasures at Kidani Village, The gift shops at Disney’s Animal Kingdom Lodge, carry some fantastic South African Wines that you can’t get in the resort’s restaurants. One of my favorite Disney wines (I've started buying it at home as well) can be found in the AKL gift shops. Wrapped up like a picnic cloth, Jam Jar Sweet Shiraz is a bottle worth buying. The grapes for this fantastic varietal are grown in Paarl Region of South Africa and hand picked from the vine and destemmed. The Rhône-like climate of Paarl is ideal for cultivation of the Shiraz grapes. Easy and enjoyable to sip on it's own, Jam Jar matches up equally well with a cheeseburger as it does dessert. Jar Jar is a fruity, semi-sweet red wine that finds a happy medium between deep tannic reds, and the cloying dessert reds. 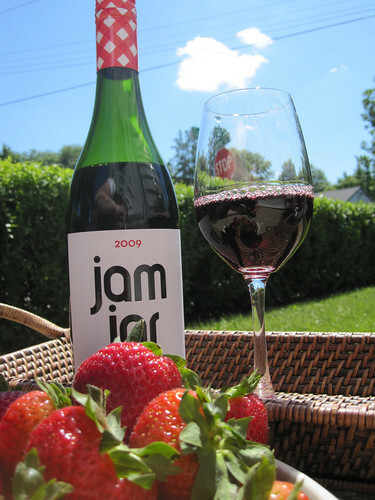 Berry like flavors of blackberries and blueberry are tempered with a crisp acidity that feels clean in your mouth. Just a touch of tannin lingers on your palette without finishing too dry. My perfect night relaxing at the Animal Kingdom Lodge, is simply grabbing a bottle of Jam Jar from the gift shop, ordering up cheese burgers from room service and dining in room as we watch the animals roam on the savanna below. Do you love Disney's Animal Kingdom Lodge? Join fellow fans over on our facebook page and follow us on our twitter feed @DisneyHotelsFan.